A new UCL study, published in the July 2007 issue of Cognitive Neuropsychiatry, systematically explores the perceptual characteristics of voice hallucinations in deaf people with schizophrenia for the first time. UCL's Dr Joanna Atkinson (Deafness, Cognition & Language Centre) has generated data from 27 deaf participants with experience of voice hallucinations, to try to determine how they experience the hallucinations, depending on the individual's hearing loss and language background. Earlier research had suggested that born-profoundly deaf people might experience true auditory hallucinations. However, the collection and interpretation of data had relied on non-native signers or hearing researchers using sign language interpreters. This study breaks new ground by using more ecologically valid methodology to confirm that true auditory hallucinations were confined to deaf individuals who are some point in their lives had experienced hearing. Dr Atkinson, who is herself a deaf British Sign Language (BSL) user, aimed to elucidate the variety of voice hallucination perceived by deaf people: "Particular attention was paid to deconstructing concepts that might be misconstrued as truly auditory to those unfamiliar with the subtleties of BSL and deaf conceptualisations of sound-based phenomena. Deaf people frequently use signs such as 'heard', 'shout', 'voices' and 'talk' without necessarily bestowing the auditory qualities assumed in English. Concepts such as 'loud' may be understood as being highly intrusive and difficult to ignore rather than as high auditory volume. Therefore, it was imperative that questions about auditory phenomena were appraised to create an accurate picture of their voice hallucinations." All the participants had a primary medical diagnosis of schizophrenia, had permanent deafness (either congenital or acquired) and clear recollection of their voice hallucinations over the past two years. Hearing loss among the participants ranged from mild to profound. They were shown a series of 94 cards describing and illustrating possible voice hallucination perception - such as 'voice uses sign language' and 'voice is in front of me' - and asked how closely they matched their experiences. Dr Atkinson's team then collated the results into five factors according to their perceptions. 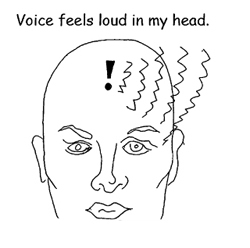 Participants born profoundly deaf reported non-auditory, clear and easy to understand voices. They were all confident that they did not hear any sounds, but knew the gender and identity of the voice. They reported seeing an image of the voice signing or lips moving in their mind. By contrast, only participants who had early experience of hearing speech described their experiences in auditory terms. Others with partial awareness of sound were uncertain whether they were really hearing sound when the voices were present. Individuals with severe language deprivation and incomplete acquisition of either speech or sign, were remarkable in that they did not experience either auditory characteristics or perception of subvisual imagery of voice articulation, suggesting that language acquisition within a critical period may be necessary for voice-hallucinations that are organised in terms of how spoken or signed utterances are articulated. The only two participants able to make extensive attributions about auditory properties were partially deaf and able to communicate fluently in spoken English. Dr Atkinson concluded: "The results support the notion that the perceptual characteristics of voice-hallucinations map closely onto an individual's real life communication preferences and experience of language and sound. The methodology demonstrates that the diversity of voice hallucination experience reflects the variety of experience with language and hearing loss among deaf individuals. While these findings may appear intuitive and unsurprising, it does represent a significant shift away from the incongruent notion that individuals born profoundly deaf might hear truly auditory voice-hallucinations despite a lack of experience with sound.